Discover a truly immersive viewing experience with the Samsung curved monitor, with 1800R screen — and its 1800 mm radius of arc for greater curvature — creates a wider field of view, enhances depth perception, and minimizes peripheral distractions to draw you deeper in to your content. Immersive Viewing Experience with Curved Screen; The 1800R curvature of the screen provides a truly immersive viewing experience that lets you enjoy big, bold and stunning panoramic views while you work or play. With its design inspired by the curve of the human eye, the Samsung CF390 monitor delivers a comfortable and enjoyable viewing experience for your home or office use. 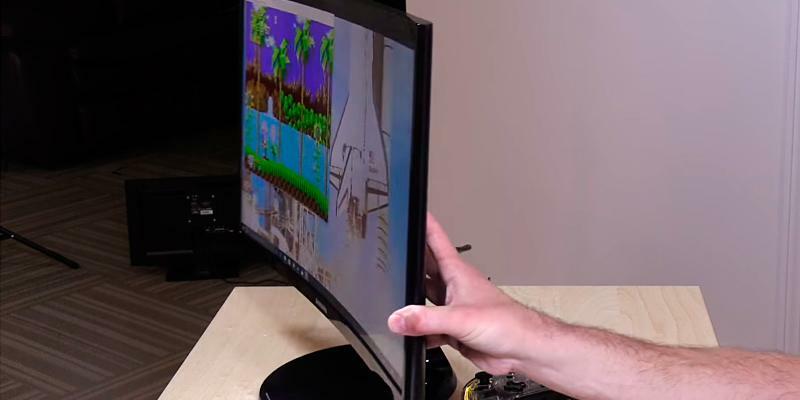 Featuring an ultra-slim and sleek profile the Samsung CF390 monitor measures less than 0.5inch thick. Make a stylish statement while staying productive with the 24" curved screen. The simple circular stand will add a modern look to your space. Advanced Gaming Experience with AMD FreeSync; AMD Free Sync technology allows users to enjoy smooth images, even during the fastest moving scenes. AMD FreeSync dynamically syncs the screen refresh rate with the frame rate of your content to minimize input latency and dramatically reduce image tearing and stutter during gaming. With its 4ms response time, you’ll see the fastest on-screen motion clearly and smoothly with less motion blur, judder and ghosting. The fast response time provides a steady visual, allowing players to experience their games at the highest level. Eye Saver Mode optimizes your viewing comfort by reducing blue light emissions and flickers at the touch of a button. Read documents, play games, watch movies and edit photos for long periods of time, and experience a comfortable and pleasing view, without worrying about eye strain or fatigue. Brilliant Picture Quality. Experience vibrant, stunningly vivid colors with Samsung's Active Crystal Color technology. The excellent 3000:1 contrast ratio delivers deep blacks and bright whites so you can clearly see even in the darkest or brightest scene. Eco-friendly Monitor: The Eco-Saving Plus feature reduces screen brightness to save power, plus the screen brightness automatically transitions fluidly—reducing energy use even more. The monitor itself is also constructed without PVC. Order the Samsung 24" Curved Slim Monitor today and have it delivered to your doorstep within 1-3 working days or same day delivery within Nairobi or Mombasa. Payment on delivery.